Interested in learning more about Nutrition Reference Center? All Nutrition Reference Center authors adhere to a strict evidence-based methodology and protocol focused on systematic identification, evaluation and consolidation of practice-changing clinical information. Our goal is to support nutritionists and dieticians in their decision-making process by providing objective and unbiased information so they can make the best decisions for their patients and clients. Nutritionists and Dietitians are often on the go. 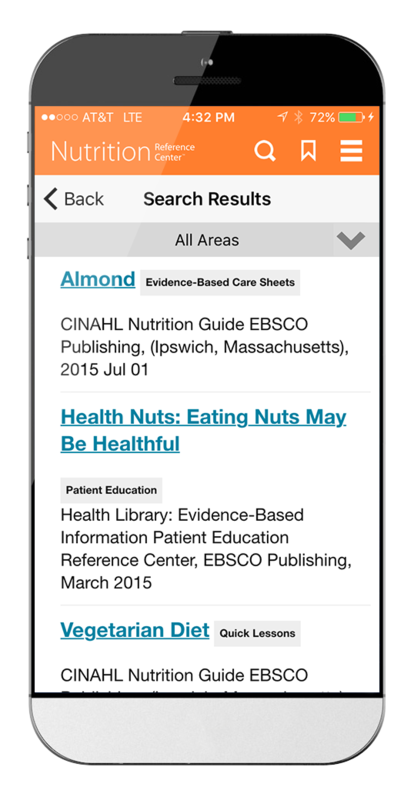 Now with the Nutrition Reference Center mobile app nutritionists and dietitians can get instant access, both on and offline, to information they need. The Nutrition Reference Center app provides user with the same rich content found in Nutrition Reference Center with the flexibility of accessing it anywhere they go.